But this was no mere accident. This was an assassination. Spy and grandson of Lord Landsdowne, Gerard Badeau is methodical in his dark, shadowy work, knowing that any display of emotion could get him killed. Something about the mysterious woman and her cool blue eyes stays Gerard's lethal hand. Now he has both a witness and a hostage. 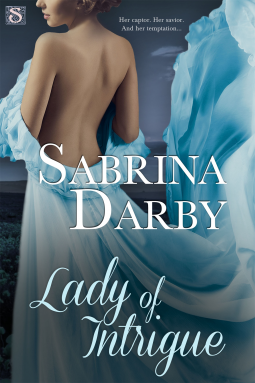 Lady of Intrigue is a completely different approach to the traditional regency romance. Gerard, the hero, is untitled, illegitimate and an assassin. From the very beginning we see the depth of his sangfroid when he causes a carriage accident and murders his targeted victim. He is not the typical hero I'd be rooting for but the writer develops his story and character in such a way that gives us hope for his redemption. The source of this redemption comes in the guise of Lady Jane Langley, who is a surviving witness to the carriage 'accident' and subsequently Gerard's hostage. As they get to know each other, we learn of Gerard's upbringing and the hardships he has endured over the years. He is actually quite a likeable character who feels guilty about Jane getting hurt in the accident and he takes good care of her. Gerard begins to question his lifestyle and hopes that he can start a new life, preferably a life with Jane. But, the fact that Jane is a surviving witness who won't be silenced about the death puts her in the line of fire from the very people who ordered the murder. There is no end of intrigue and suspense as the pair try to sort their out of trouble. One aspect of Jane's character that I wasn't too enamoured with was her refusal to marry Gerard until he could procure a title to allow her to maintain her position in society. This puts him in a very awkward and dangerous position. Her realisation that she loved Gerard enough without a title came too late in the story for me. Apart from this flaw in her character, I enjoyed Jane and Gerard's story. I also loved the supporting characters. Each one of them had their own very interesting life story behind them. I'm hoping this is the beginning of a series as I'd like to continue the excitement and adventure with Gerard's diverse family as they flock to live with him in his new home.